I feel that Raveneau always needs to be imbibed on the right occasion with the right people. This was certainly the case last week as I convened the planning committee for the annual Burgundy trip at Les 110 de Taillevent. I confess that the restaurant excelled themselves. The tasting menu combined foie gras, lobster, halibut and duck. Who would not immediately chose such a menu!? We were close to ordering a bottle of Didier Dagueneau to go with the goat's cheese but there was a wide selection of wines from legendary Chablis producer Francois Raveneau. The som immediately agreed that the 2010 would be good. And boy was it good. A beguiling nose of grated lemon, limestone and white flowers. Incredibly suave, long and fine on the palate. Sheer quality. Conversation stopped for ten minutes as we pondered the greatness of the wine. And this is a lower end premier cru. 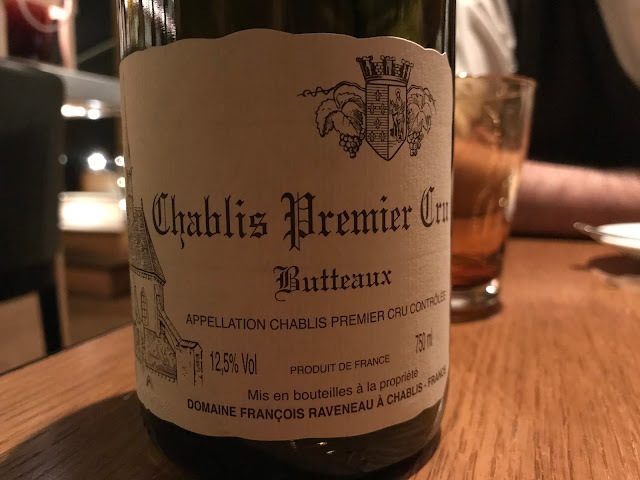 Raveneau wines are considered to be age-worthy and this 2010 Chablis 1er Cru was at the top of its game. No need to keep longer as the fruit will soon start disappearing. 92/100.